I came up with my own proverb that I wrote down in my Art Journal to remember it (on the left page in the journal spread, written in Swedish). It says; It’s better to have one crochet project in your hand than 10 unused balls of yarn in the yarn basket on the floor… :-) I imagine there must be a lot of great sayings like that that hasn’t been invented/written yet. I want to come up with more wise words like this, to make my own book of proverbs. Art Journal spread featuring my handwriting. 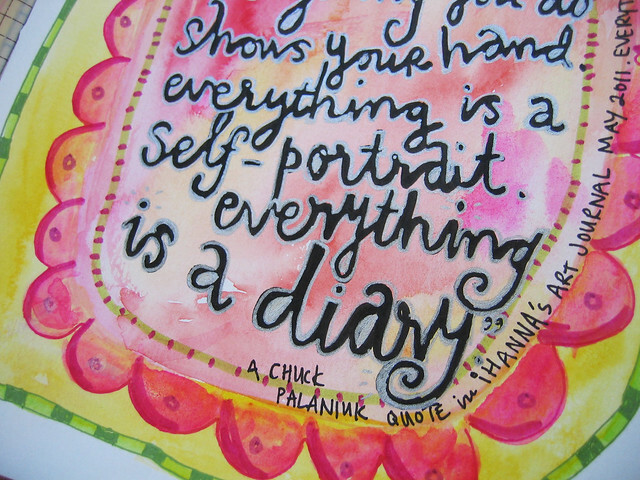 Also, I love this quote by Chuck Palahniuk! Your handwriting. The way you walk. Which china pattern you choose. It’s all giving you away. Everything you do shows your hand. Everything is a self-portrait. Everything is a diary. Watercolour background, and text with Pitt Brush pens and Sakura gelly roll pens. 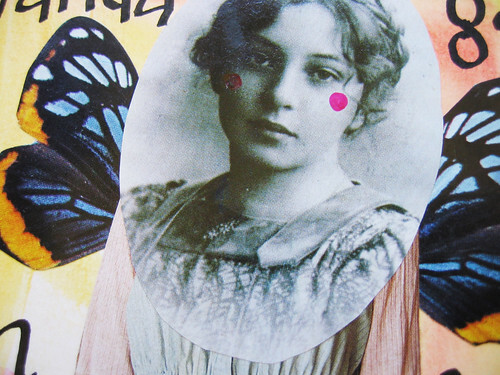 Saffron Bun girl that I made on a page a few years ago that now is incorporated into the journal. Yay! Sorry I haven’t posted much (again) this week. I’m busy all the time right now. This weekend we’re having an embroidery exhibition but I thought I’d quickly post some journal pages that I really love and enjoyed making. This entry was posted in Art journaling and tagged art journal detail, collecting quotes, diary, hand writing, proverb. Bookmark the permalink. 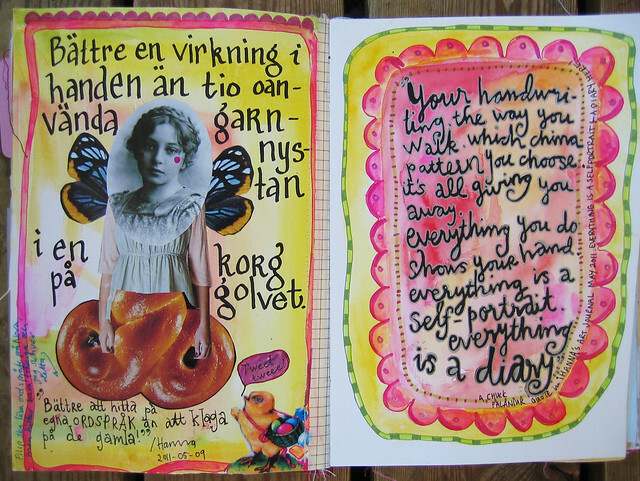 Love, love, love that spread and both those sayings are fabulous (like seeing a bit of swedish on your blog every now and again!)! The whole spread is great– the quote is very interesting– I’ve thought very often that you can tell a great deal about a person by noting what they like, or what they are passionate about. My favorite part, though, are the pretzel legs!! Great quotation. 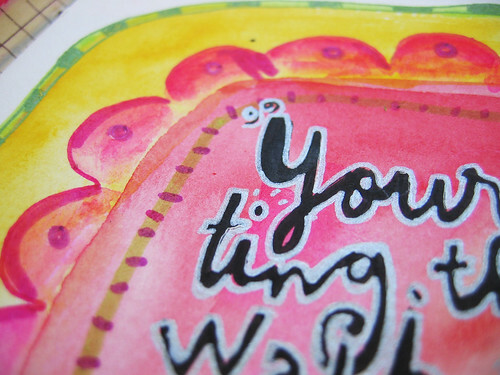 And I really love the watercolors on your journal page. Can you believe I only JUST discovered white gel pens maybe three months ago? I love the look of outlining bold black letters with the white gel pen; can’t believe it took me so long! Gorgeous pages! Such great quotes as well! You simply have to love these pages! I really do! I love your bold and bright page Hanna! The proverbs (both!) are great! 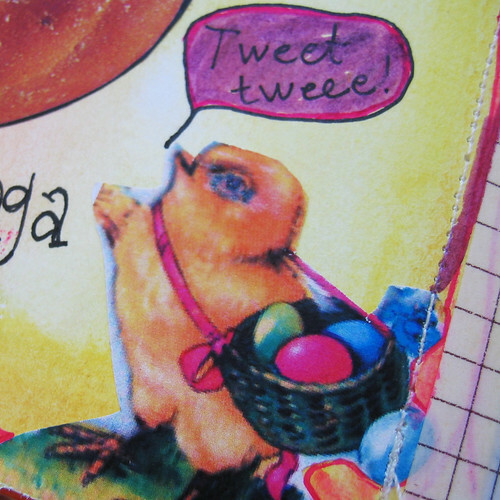 Love the bright colours and the different writing styles, and of course the cute easter chicken! Cheers to you! Your new proverb is perfect…and one I need to apply to myself. Not for the crochet, but for oh, so many other things! Great quotes and the pages are lovely! such YUMMY lettering and colors!!!! love it!